With Halloween coming up fast, many people have been binge watching some of their favorite Halloween classics, such as “A Nightmare on Elm Street,” “Halloween” or anything Tim Burton. Included in those big names are stories by Stephen King. Since “It” was released, the film has been a hit with high approval ratings. Now that the hype for “It” has winded down, Netflix released its own Stephen King film with ratings to match the big-screen movie. 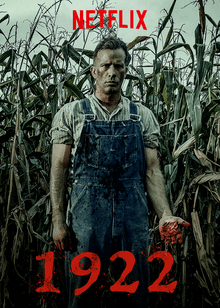 Based on King’s novella, Netflix has adapted King’s written work “1922” into a Netflix Original movie. As King still writes today, it’s no shock the novella is rather new. The novella was published in 2010, but as the title suggests, the story takes place in the early 20s. The plot is based around a midwestern farmer, Wilfred James, who conspires to murder his wife, Arlette, with the aid of his only son, Henry. Arlette wanted to sell her portion of the farm, move to the city and take her son. Henry only wanted to live on the farm with his dad and continue to court the cute girl down the road. What sounds like the standard LMN channel flick turns out to be much deeper than the standard marital murder movie. The murder isn’t half of the horror. King employs hatred, guilt, regret, insanity and hysteria as some of the themes expressed in the story, which director Zak Hilditch clarifies through lighting, music and the incredible acting from Thomas James. The music is subtle in most places but extreme in suddenly sharp sounds. Hilditch also uses the sounds of the wind and other natural sounds to offset the loneliness Wilfred feels in the middle of nowhere. Where Wilfred’s farm was once considered a place of peace and prosperity, as winter sets in, Wilfred understands just how isolated his wife felt. As for the father-son dynamic, it’s certainly strange from the beginning, but once the darkness of their sins grows between the two, it’s clear how irony becomes an immediate role next to impending madness. One of the most recurring themes for the film are the rats. Their clicking, squeaking sound always rests in the back of Wilfred’s mind. The rats are a constant reminder of his wife’s death, a symbol which only appears in the movie when death is near. “1922” is a captivating story that not only gives you goosebumps, but the film also forces the audience to question time’s change. The plot covers the space of one year, beginning with a man giving into his dark temptations and ending with a man’s realization of how his actions define him. Jessica Dunker is a junior at ETSU as an English major with a double minor in journalism and creative writing. She was born in Johnson City but later moved to Loudon, TN at the age of seven. Returning to her hometown, she has enrolled herself at ETSU as a student in the honors college. She is also a member of Admissions Ambassadors and the English National Honors Society. After she receives her bachelor's degree, she plans on moving to New York, where she will pursue her career as an editor. As an aspiring author, her first book was published in August 2017 on Amazon.